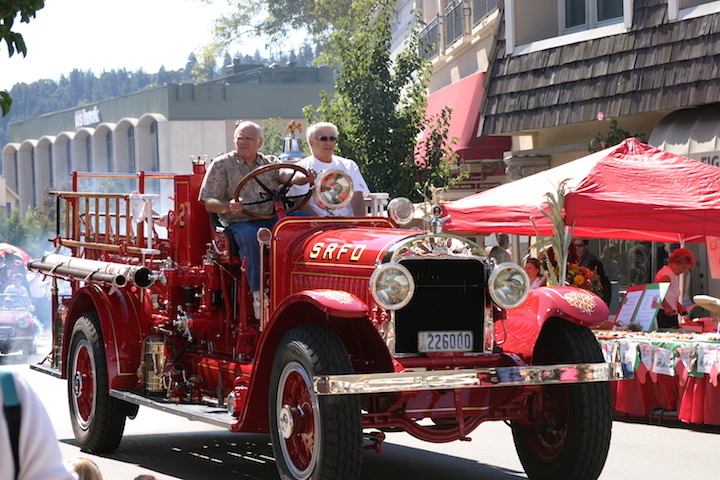 Bob Marcucci (driving) and his brother Marty in the Stutz in the San Anselmo Parade in 2009. Stutz from Tom Forster on Vimeo. Story by Tom Forster, originally published in the Society for Preservation & Appreciation of Antique Automotive Fire Apparatus in America (SPAAMFAA) newsletter Engine!Engine!, 2014-4 Fourth Quarter Edition. 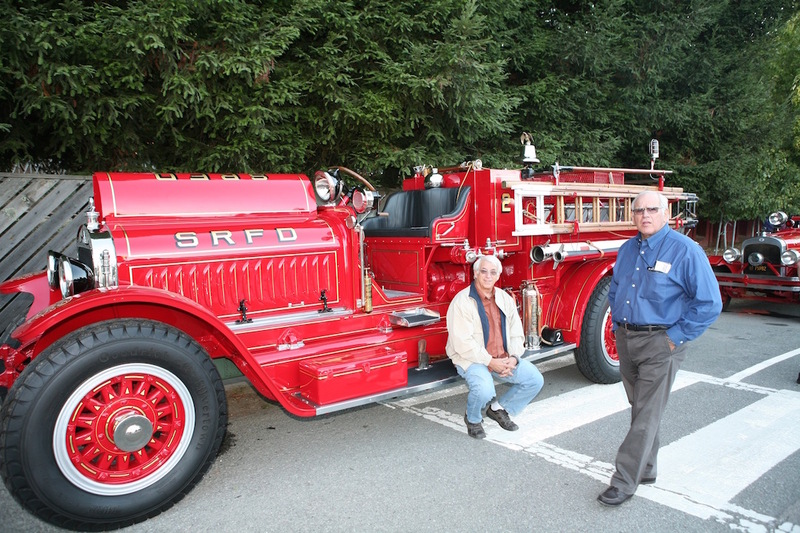 SPAAMFAA member Robert Marcucci has restored a 1992 Stutz pumper to showroom condition over the past 14 years, with much help from his brother Marty. Both are retired career fire service officers. Bob was the long-time Fire Chief of the City of San Rafael in California, and Marty was a Battalion Chief in the neighboring Ross Valley Fire Protection District. Their father Nello Marcucci was the long-time Fire Chief of the Town of San Anselmo where they grew up. Both remember as kids sneaking into the back seat and hiding on the floor of Dad’s car on occasion to go to fires. The Stutz was originally purchased by the City of San Rafael in 1921, and served until 1949 before being sold. San Rafael is located about 15 minutes north of San Francisco, in Marin County. 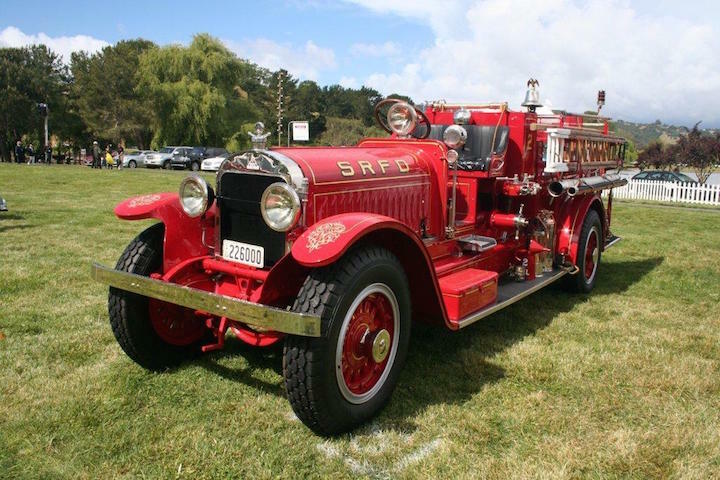 The Marin County Independent Journal reported on December 8, 1921, that the City of San Rafael had purchased a 1922 Stutz Fire Engine costing $12,750. The Stutz representative had reduced the cost by $250, since the engine had been used for demonstration purposes. The paper also reported that the sale also included pneumatic cord tires, whereas other engines at that time were usually delivered with solid rubber tires. The purchase ended a controversial selection process that included Seagrave, American La France, and Stutz representatives. The Seagrave and American La France salesmen had engaged in some questionable actions according to the article. City fathers noted that the Stutz representatives, however, kept themselves “…aloof from the squabbling…” with conduct as "…high class business men." The Stutz engine was identified as Serial Number 195, Engine Number 250, a 1922 Model C 750 gallon per minute pumper, with a 120HP Wisconsin T Head, Type P motor, number 1332. It was San Rafael FD's first pumping engine. The motor also had three heads, with two cylinders in each head. As with most fire engines, the engine has a dual ignition system. During the period between 1922 and 1949 the chemical tanks on the engine were replaced in lieu of a water tank and the pump modified to supply water and pressure to the hose reel atop the engine. The pumper was in service in San Rafael for 27 years, until October 21, 1949. The engine was eventually sold (date unknown), and its location remained a mystery for many years. It was located in 1983, as one of many exhibits in a collection of historical vehicles in Morgan Hill, a city south of San Francisco, owned by a collector named Irv Perch. He was described by the San Jose Mercury News as a “perpetual entrepreneur”, and had amassed large collections including airplanes, vehicles, and license plates. Upon learning about the location of the Stutz, Bob Marcucci traveled to a restaurant that Perch owned in Morgan Hill and sought him out. Perch indicated he had seen the Stutz in a field long ago and purchased it from the owner. The engine was in poor condition. Bob asked Perch if he’d like to sell it, and a deal was made. The goal was to restore the engine as it was portrayed in a photograph when placed out of service in 1949. “We restored the engine, for historical reasons, once we really understood how rare Stutz engines were. We both enjoy working on old vehicles. At the beginning we really didn't understand the amount of time it takes to restore a fire engine as opposed to a car,” said Bob, “Little did we know how long it would be before we could find the time [basically in retirement] to complete it”. During the period 1983 to 2000 the engine was stored behind the Marcucci's old family home covered with tarps. A few years prior to his retirement as Fire Chief, Bob decided that the time was right to start the restoration. Being in “extremely rough condition”, the engine was shipped initially to a fire apparatus manufacturer in Oakdale, California named Hi Tech Emergency Vehicle Service, Inc., based in what was originally the building of longtime fire truck manufacturer P.E. Van Pelt. The engine was stripped to the frame, the rust removed from the body panels, the water tank and fenders repaired, and repainted, and the engine reassembled. It was then shipped back to the family home and placed in a garage type structure, where during the next five years further restoration took place. This included gold leafing as per the original design as photographed prior to the restoration process. Restoration was made difficult as few Stutz engines presently exist on the West Coast and there was no local authority to consult. Fortunately a book by Rodger Birchfield titled "Stutz Fire Engine Co." was obtained. This manual was then constantly referred to as the authority. As an example, when the engine was delivered in 1922, it appeared to have an electric siren, while in the 1949 photograph it had a Sterling hand crank siren. The engine was completely rewired using new wiring, which duplicated the wiring of the period. The original wiring had terminal soldered ends while those of today are usually crimped. Terminal ends of that vintage could not be located, so ends were manufactured from cooper tubing to reflect the terminal ends used on the Stutz. The radiator required complete restoration, including a new core. Both the upper and lower tanks were repaired or replaced, and the radiator was nickel-plated. The generator needed to be rebuilt; and the intake and exhaust manifolds had cracks that required welding. The wooden slat hose bed was non- existent, so wooden oak planking was installed. In addition, the hose roller on the rear bottom of the hose bed was missing, so a replica was made and installed. The side rollers needed to be restored and the metal ends nickel-plated. Sections of the wooden steering wheel were taped together, so they were completely disassembled and glued back together and refinished. The distributors were examined and found to be adequate, though further research did not reveal the identity of the distributors; hence parts were unavailable for subsequent repair. The coils were also replaced. The speedometer cable and front left wheel gear were repaired, and a speedometer of the period, presumably on Stutz's of that vintage, was purchased. The chain links in the speedometer housing cable kept breaking, so a modern cable was installed. Fortunately the large suctions hoses (white in color) were still on the engine, and the couplings were removed and nickel-plated. There were two suction hose racks, on each side of the engine, one for the larger and another for a smaller suction hose. The smaller suction hose was purchased and couplings of the period were installed on the hose. Wooden truss ladders of the period were located, refinished and installed on the engine. All the railings, head and spot light couplings, discharge gate and suction caps, etc., that were nickel plated, were re-plated. Motor compartment components, which were nickel plated, were re-plated. New tires were purchased and installed. A new front bumper was made, nickel plated and installed. The motor oil pan was removed, cleaned, and the oil pump checked. The motor did not require any work and started after several attempts. All the fluids were changed and lubed, which in itself was interesting without a lube chart. “With a motor over 90 years old things keep popping up, like needing to change the bearing for the fan and figuring out how you get to the bearing, or how you lube and adjust the clutch or rear brakes,” said Bob. The 1949 photograph showed a basket for miscellaneous equipment above the hose bed. “Using the photograph, we calculated the size of the basket, and made one of like proportions and installed it,” said Bob. Recently a hose reel was added. When the Stutz was delivered in 1922, it had a hose reel. This hose reel did not appear in the 1949 photo. Referring to Roger Birchfield's book, we duplicated the hose reel brackets and installed a hose reel similar to those of 1922. The restoration in 2014 is mostly complete. Bob Marcucci says the biggest challenge going forward is proper maintenance. “For example, Saturday morning the mechanical brakes basically failed and now need adjustment”. The Stutz only has mechanical brakes on the rear wheels, with no brakes on the front wheels. “How do you adjust mechanical brakes on a Stutz? This will be another learning experience.” At a car show recently in Marin County, several old time restorers said that they believed that the Stutz was worth well over $150,000. “I don't know how true that is, but it's not for sale”, he concluded. 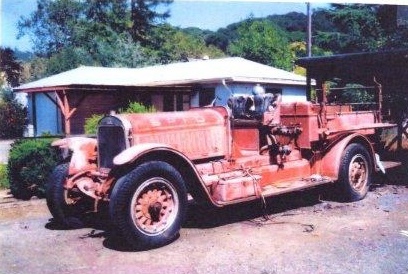 The Stutz was in poor condition when found in Morgan Hill. The completed restoration on display at a car show. Marty (seated) and Bob Marcucci displayed the Stutz at the entry to the Larkspur Association of Volunteer Firefighters 100th Anniversary Dinner Dance in 2013, held at Escalle Winery in Larkspur.